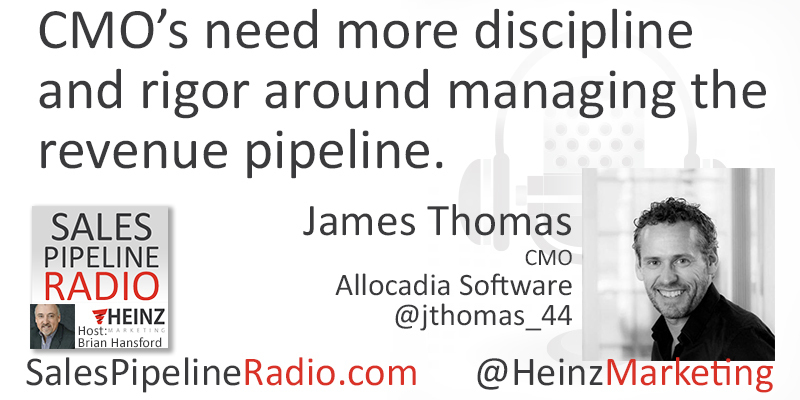 Brian Hansford hosting this episode with our guest, James Thomas, CMO of Allocadia Software. They will be focusing on MPM and will drill into how CMO’s need more discipline and rigor around managing the revenue pipeline, looking at past performance, and using the data to guide future performance. Experienced Chief Marketing Officer with a demonstrated success leading award winning teams in the high tech industry. Expert in marketing management, enterprise software, Software as a Service, pricing, packaging, messaging, inbound and outbound demand generation, go-to-market strategy, and strategic partnerships.